How to tackle a bedroom makeover? 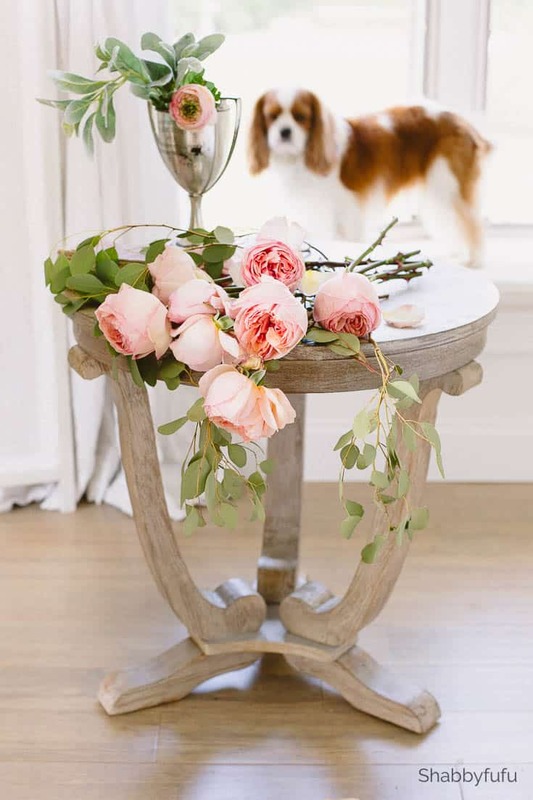 It’s easy to add simple touches like a fresh coat of paint and new linens and budget friendly. I’ve done that several times in our master bedroom over the 25+ years that we have lived in this home. In the back of my mind there has been a plan for a long time. With other things always on my plate I just never got to it, but now the wheels are in motion…finally! I shared the planning that I did virtually with Modsy on the master bedroom makeover and it’s kind of like writing things down. My husband the general contractor carries around a sketchbook and while it may be old school he draws chicken scratch of project designs. Some of the aspects that we feel as a designing couple are important to a master bedroom makeover? If you ask him he’d probably answer more practically than I would. Comfort would be number one and I do agree that with sleeping your bed should be the most comfortable that you can afford. Thankfully these days there are lots of options and they will come straight to your home. Here are some other tips for what to consider when you are thinking of switching out what you have. What is your style? That’s something that I was asked by Modsy and I actually gave them several design styles that I feel fit. You don’t need to box yourself in, but think about what you love and not necessarily what’s trending. What are your go to colors? I don’t really subscribe to the “color of the year” stuff and go with what I love. How about you? My favorites have always been neutrals and soft pastel shades of blush, faded blue and grey. With white walls it’s really a no-brainer and we LOVE Benjamin Moore White Dove. The center of the room. The largest piece in your bedroom is always the bed obviously. Think about placement and yes…chicken scratch the layout on paper if you’re thinking about moving the bed. Dressing the bed can be an afterthought but look at placement and consider Feng Shui. Lighting options. The lighting in a bedroom is so important, probably more than any room in your home. I’m going to loosely include window coverings and window treatments in this, as you’ll want to consider the best options for your room and budget. Later this week I’ll be sharing what I selected for my how to tackle a bedroom makeover project! Storage. Again I’ll refer to my Modsy plan (so helpful to learn how to tackle a bedroom makeover) and how I told my design consultant that I needed storage. There are so many options for storage and a bedroom should be a restful haven, so distractions should be kept to a minimum. If you decide to use Modsy, I have a coupon code for you. Enter FUFU20 for a 20% discount off the design package of your choice. I’m sharing just a couple of new pieces in my master bedroom today and have lots more to share in the weeks to come. Knowing the “before” I think that the “after” is going to be amazing friends! It didn’t start with the chair, but I wanted a true sitting area in our master bedroom so that I’d have a spot to read in. This is likely going to be just a place for me (and the pups), as my husband just rolls on into the master bedroom to sleep and not relax. We have a no television rule in the bedroom and in fact the only televisions that we have are in the family room and his den/office. 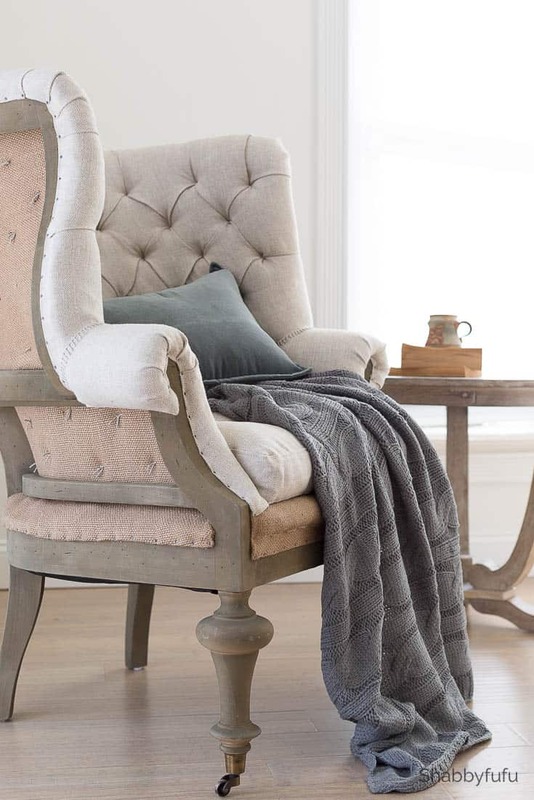 This GORGEOUS French style chair is the Fontaine Wingback Chair from my friends and sponsor Soft Surroundings. You’ll find that chair HERE if you’d like to know more of the details. It’s so comfortable and I’ve seen this similar chair for more than twice the price, so I feel that the value is really here with this one! Funny story and it was one of those that I wish I had my phone in hand to film at the time. When the delivery person was unboxing the chair he looked at the sides scratching his head. Then he looked me in the eyes and said “lady, something is wrong with this chair. I think you need to send it back.” Insert laughing emoji. Guessing that he had no idea what a deconstructed chair is. I assured him that it was all good, tipped him and he was on his way! A sophisticated spot for my morning coffee and reading the newspaper on my tablet! Flowers on repeat from the chair in the first shot! If you are local to the Miami, FL area…Soft Surroundings is opening a store in The Falls Shopping Center and it’s been long needed here! Watch for the GRAND OPENING on October 26th and I’d love to meet you there! 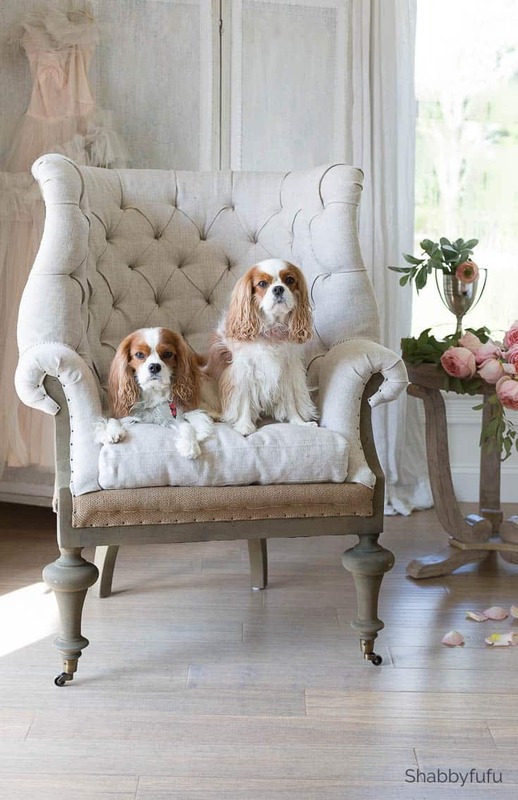 Love your chair and it is made perfect with your cavaliers. We just painted our upstairs a beautiful Benjamin Moore white, Gardenia, that goes with everything and does not change color depending on the light or any colors added to the room. It opened up the rooms so much so that the night light I left on had to be changed so I could sleep. Or maybe I loved the new look so much that I was so in love with it that I couldn’t sleep. Looking forward the the full reveal. Thanks Alice! Although I’ve worked as a color consultant in the past with Benjamin Moore, I’m not too familiar with Gardenia. Will have to check it out! 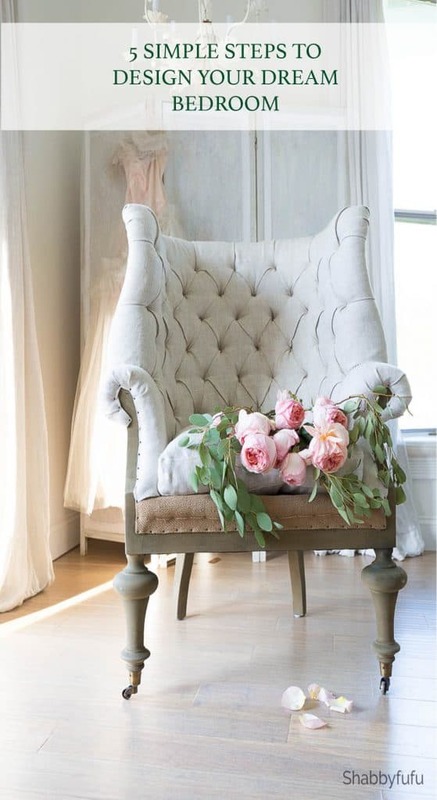 Thanks for stopping by Brigitte and I love this chair too! Hope you have a great week ahead. Excellent points! Sometime “old school” is the BEST school. Very true! I don’t wear a lot of pastels either…usually black and white. Your room is lovely, but those dogs…………………..oh, my goodness! I think they are so cute! They should be models—they are just perfect! Very pretty. We have the same rule with TV. We only have them in the same spots as you. Many of our friends have them everywhere. I don’t watch much tv at all, but admit to some mindless Housewives watching at times. Lots of more constructive things to occupy time! Hi Janet! I love that chair and the table! So pretty!! The flowers are gorgeous and I’m so excited to see the final result! I’m also excited for the Grand Opening of Soft Surroundings at the Falls! Can’t wait to meet you!! Blessings! !